India is looking at a comprehensive review of the decade-old Limited Liability Partnership (LLP) framework including steep penalties for nonfiling of returns. The ministry of corporate affairs will soon set up a committee to review the structure of LLPs, touted as a low compliance hybrid between companies and partnerships. The review comes following representations about a Rs 100 per day penalty for delayed filing and difficulties faced in dissolution. The ministry is also likely to ask the committee to consider the office memorandum by Registrar of Companies, Manesar, that said LLPs could not undertake manufacturing and stopped any one carrying out manufacturing activity to register as LLP or convert existing corporate structure to LLP. The memorandum that had sent the industry into a tizzy has since been withdrawn. “A committee would be soon set up to review the LLP framework and look at issues that have cropped up in the past decade in its implementation,” a senior government official told ET. Since any dilution of the penalty clause would have required an amendment to the law, notified on April 1, 2009, itself, it was decided that a review of the entire framework should be carried out in a comprehensive manner with the underlying theme of ‘Ease of Doing Business,’ the official added. The government has over the last one year received several representations on the penalty issue from individuals who registered an LLP, but did not carry out any business and wanted to dissolve. Penalties were kept steep as this structure came with less compliance, but has led to people facing huge financial burden even if they genuinely could not run a business. Besides, lesser compliance compared to companies, LLPs also offer tax advantages with exemption from dividend distribution tax (DDT) and minimum alternate tax. Owing to flexibility in its structure and lesser cost of compliances as well as ease of formation, it is an ideal form of organisation for small entrepreneurs and for investment by venture capital. Expert say that it was envisaged that over a period of time, instead of forming private limited companies, LLP form of organization would become the preferred choice and more and more private companies would choose to convert into LLPs.However, certain issues have prevented this from happening, they say. “It was expected that because of its unique advantages, medium and large sized partnerships would voluntarily choose this vehicle for doing business and in turn get into the domain of ‘organized sector’,” said Pavan Vijay, Founder, Corporate Professional . Even after 11 years of enactment of this law, public sector undertakings continue to put the condition of the tenderer being a registered company, Vijay pointed. “Globally, structures like LLPs exist and are encouraged for private businesses and professional services to adopt, as they provide a good balance between corporate governance and limiting the liability of the partners,” said Vikas Vasal, National Leader Tax, Grant Thornton in India. Vasal said, in India, while LLPs are gaining traction, there are issues that require some consideration and clarity. “These include doubts raised on whether an LLP can carry out manufacturing activity, issues linked to transfer of partnership share in case of a partner leaving the firm or selling his share, return of capital, ownership of property in the name of LLP,” Vasal added. 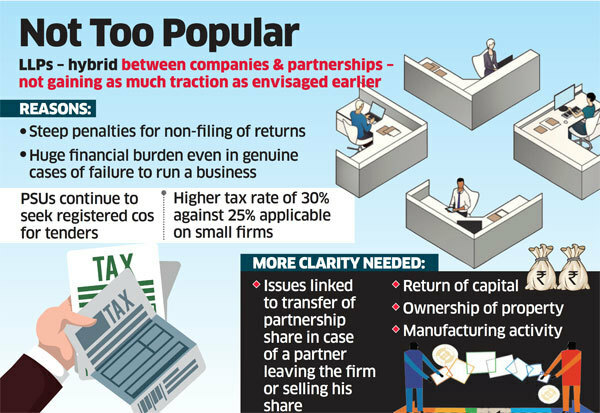 Experts also point at issues like higher tax rate of 30% applicable on LLPs in comparison to 25% applicable on small companies besides a simpler process for dissolution.